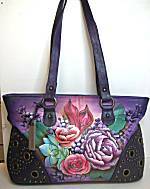 On this page we gather PURPLE shades of jewelry and handbags! Regal and rich in darker shades, then fresh and feminine in the lighter pastels, this color starts out as our "next favorite" after pink when we are little girls, but stays right with us all our lives. 2-1/8 inches long on sterling earwire, 7/16 inch across. Long metal panel is curved toward back and colored in soft mauve and lavender blue, a cutout pattern of daisies in lavender lays on top. 1-3/4 inches long on sterling earwire, 3/4 inch across. 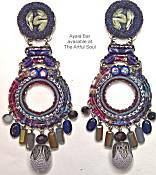 The onion shape metal has a moorish cutout motif, colored in periwinkle lavender wiblue beads above. 1-1/2 inches long on goldfill earwire, 7/16 inch across. Elongated bell-shaped metal is deep plum win color, topped with brass squiggle and cranberry bead setting. 1-1/4 inches long on sterling earwire, 3/4 inch across. Moroccan shape of metal cutout filigree in violet purple has a lotus accent in light blue at the bottom, small light blue crystal sparkling from center. Rich with color of glasslike jeweler's resin, this bangle has oval shape, hardware in gold vermeil (18kt gold over sterling). 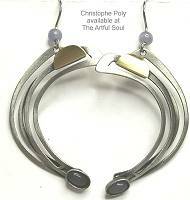 Hinged for easy on-off (hinge stays under wrist), and magnets in the ends help keep it closed. Measures 2-3/8 inches across, 1-3/4 inches deep, for small to medium wrist. 1/2 inch wide and rounded top surface. The color is translucent bright violet purple. Approximate 7/8 x 3/8 inch column of colored porcelain is suspended from sterling earwire with white pearl at the bottom. Platinum edging along the top. Dangling length about 1-7/8 inches. Aquarius colors are orchid, lavender and blue with aqua and green. 1-1/2 inches long including sterling earwire. 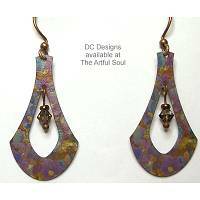 A cutout brass shape in form of lotus blossom is colored in orchid purple, about 3/4 inch across. 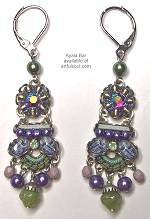 1-3/8 inches long including stelring earwire, 7/8 inch round lacy doily design is colored vibrant orchid purple. 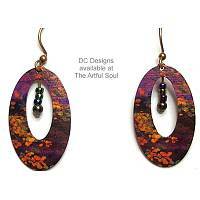 1-1/4 inches long including sterling earwire, 3/4 inch almost-round disk has spiral pattern revealed by violet wash of color, smaller silver disk and purple spiral on top. 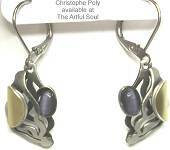 3-1/8 inches long, 1/2 inch across, on silver plated french earwires. Constructed of brass and/or aluminum that is plated. Shiny gold and lightweight shapes combine with a sliver of satin gold and elongated lavender cats-eye cabochon for graceful design, freely singing curves below. Pendant measures 3/4 inches across, 2 inches tall, constructed of brass and/or aluminum that is plated. 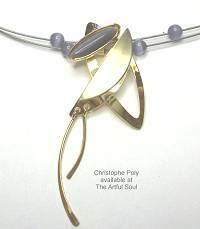 Shiny gold finish shapes curve and cross below an elongated lavender cats-eye cabochon, slender golden bars swing lightly below. Pendant is suspended from a pair of thin cable wires, 17 inches long, secured by magnetic clasp. Purple beads roam freely, a pair on each side, along the cable. Pendant measures 3/4 inches across, 1-3/8 inches tall, constructed of brass and/or aluminum that is plated. Dull nickel silver finish curved semi-circle graces the side of large purple cats-eye cabochon, satin gold folded circle and smaller lavender cabochon grace the outside of the crescent. Pendant is suspended from a pair of thin cable wires, 17 inches long, secured by magnetic clasp. 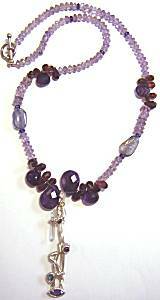 Purple beads roam freely, a pair on each side, along the cable. 2-5/8 inches long, 3/4 inch across, on silver plated french earwires. Constructed of brass and/or aluminum that is plated. 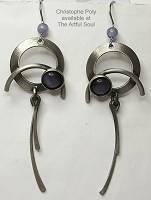 Nickel silver matte finish circle has curving bars across and dangling below, a single round purple cats-eye cabochon nesting on one side. 2-1/4 inches long, 1 inch across, on silver plated french earwires. Constructed of brass and/or aluminum that is plated. 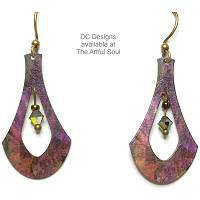 Nickel finish curved bars swoop dramatically toward a small purple cats-eye cabochon at the bottom, joining to folded satin gold circle at the top. 1-3/8 inches long, 7/8 inch across, on silver plated french earwires. Constructed of brass and/or aluminum that is plated. 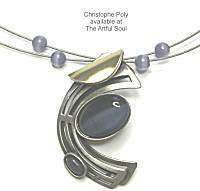 Nickel finish metal cutout like a tornado of curves, holds purple cats-eye cabochon within the center, a satin silver circle rests below.